In a previous post, we talked about how to mute color with complementary colors. I have mentioned before that I personally prefer not to use black in watercolor. This is because watercolor is a transparent medium and sometimes the black right out of the tube is somewhat opaque. 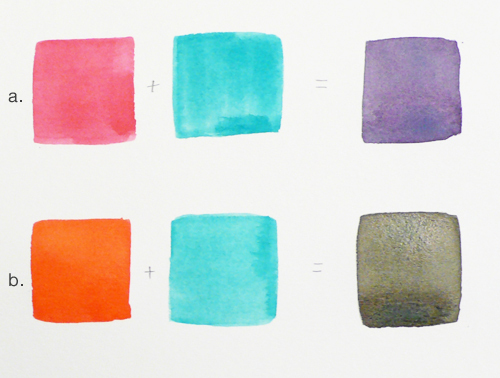 This means when you are mixing black into another color, your watercolor risks getting muddy and dull. The best way to get black when you need it is to mix the complementary colors together. In this article, I will show you some color mixing tips using complementary colors with watercolor to get black, a nice gray color (usually for cast shadows), and samples of muting green. In the image to the right, you can see how example A does not come out quite black, it’s more of a purple. This is because Vermilion, which is a warmer red, is actually a more direct complement of Viridian. With example B I get really nice neutral black. Image of my palette of mixing Carmine and Viridian. Instead of Viridian, I can use Deep Green, which contains more yellow than Viridian, and I get really nice neutral black too. One of the advantages of mixing black with complementary colors is that you can easily adjust the temperature of your black. For example, at the bottom of the image, I have made a warmer black basically by mixing a little bit more Carmine in and a cooler black by mixing a little more Deep Green in. 2. Tips on getting nice clean gray. These two colors are not exactly complementary colors. However, Brunt Sienna is basically a muted orange. By mixing these two, you will get a nice neutral gray. At the bottom of the image, you will see the nine swatches are showing neutral gray, cooler gray, and warmer gray and different shades of gray by just using Ultramarine and Brunt Sienna together. Here is the example of using a different blue - Cobalt Blue with Brunt Sienna. The result is a greener gray. So, at the bottom of the image, I took the gray I got from mixing Cobalt Blue and Brunt Sienna and mixed it with a little purple, to get bluish gray. Green is probably one of the hardest colors to master, especially in landscape paintings. It can be difficult to have it look natural. A common mistake by beginners is having too much of vibrant greens in their landscape paintings, and as a result the paintings sometime look fake as the color is too saturated. To get a green that looks natural just mix some its complementary color, red, in to the green. For example, in the image above, I first got a light green out of mixing Lemon Yellow and Deep Green. You can notice the color still saturated. Next, I mixed the Vermilion with the light green I made and the result is at the far right of the image. Notice the result is more muted and neutral in color. In this image to the right are more example of greens that I mixed with red. The second row is the result of mixing a little of Vermilion into the swatches on the top row. There is a wide range of colors you can get from mixing complementary colors. The best way to get to know your colors is by doing swatch exercises. 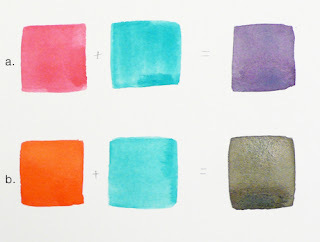 Mix the colors you have and paint color swatches on paper. This also gives you a reference for you to use in the future as you get to know how to mix colors better. You don’t have to just mix two colors together, sometimes you can mix three or even more to get the result you want.